In May, the library will offer programming based on the All Iowa Reads book, Lila, by Marilynne Robinson. Set during the Great Depression, Lila is a homeless woman who finds a home, love, and redemption. Bill Jamerson, historian and songwriter, will present Dollar-A-Day-Boys, a musical tribute to the Civilian Conservation Corps. Over 3.5 million men enlisted in the corps including around 200 men at Camp Spencer located for six months at the Clay County Fairgrounds. Dollar-A-Day Boys is full of hilarious stories and foot tapping songs that make it a "must see" experience! 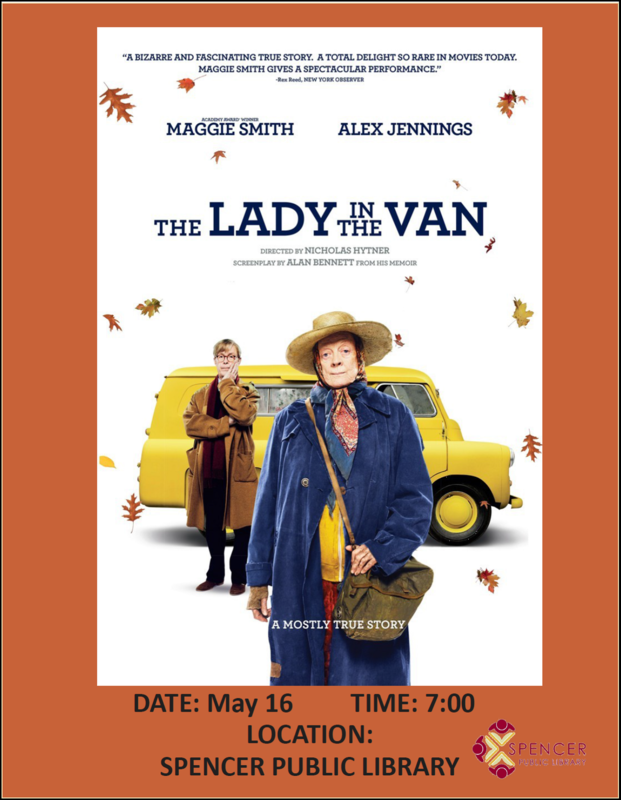 To tie into the homeless theme in the book Lila, we will be watching the movie, Lady in the Van starring Maggie Smith. To end our All Iowa Reads programming, we will discuss the book Lila. Also in May, the Book into Movie Club is reading What's Eating Gilbert Grape by Peter Hedges, Gilbert Grape of Endora, IA, is a small-town young man with a lot of responsibility, who eventually has his life shaken up by the free-spirited Becky. With the physical and mental health issues so thoughtfully portrayed, What's Eating Gilbert Grape? is the perfect movie to watch in June during our Exercise Your Mind: Read Adult Summer Reading Program. So, read the book in May and then watch the movie in June.